Varnishing, why do we varnish, and why would we not? 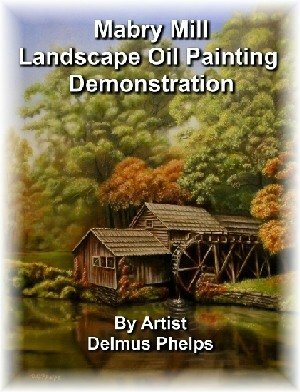 Hi Delmus, could you please tell us what you use for varnishing? Do you wait 6 to 12 months? Do you use a touch-up varnish? Matte or gloss? This whole varnishing thing is driving me crazy, lol! Hi Cynthia! Yes, lots of options, lots of reasons for each option, so I'll try to simplify the issue and give you my opinion. There are loads of opinions on this one subject, so I'll just add one more to the pile you will find on the internet these days. When oil painting was at it's height during the Renaissance era, varnishing was a must. Homes were heated with coal, oil, wood. Making for lots of soot. As time passed, heating changed and cleaner home environments developed but folks enjoyed smoking tobacco. These 2 items would require that a painting be protected with a removable coating. Considered the best of the natural picture varnishes Damar provides moderately high gloss and increases the brilliancy of the color. Responds readily to ordinary solvents employed during the restoration of paintings. Why removable? When it becomes saturated with pollutants and begins to yellow, it's removed and a fresh coating applied. There are some that say we don't even need to varnish any more because our houses are so clean. A simple "oiling out" is all that's necessary. Here's a link to a video on "oiling out" on my site that shows the process and the mixture to make. It opens in a new window. Most paintings going out of my studio are only "oiled out". I leave instructions with my galleries that if a customer wants, I can varnish it for them once the painting has dried for 6 months. If the painting doesn't sell, and I have possession of it before it goes to another, I sometimes will go ahead and varnish it. If the oiling out doesn't bring my colors up to what I expect, (those that have "sunkin in and are matte finished") I will use a spray on re-touch varnish. You can also use a 50% varnish to 50% turpentine mixture for the same purpose. The coating is light enough and thin enough to allow the oil painting underneath to continue to cure without cracking the varnish layer. Yes, as the paint cures, it moves, and if you've varnished too soon, you will see spider veins within the first 6 to 8 months which will increase in size as the paint underneath fully cures. As I use a dryer in my paintings, I can sometimes varnish sooner (3 months). In the thickest painted areas (usually the light highlights) I do the fingernail test. Pressing my fingernail into the area, if it doesn't budge, its hard enough to varnish. If I see a small indent, I leave it a little longer (months) before attempting to varnish. I know, it doesn't sound scientific. But I've never had a painting returned due to cracking, or de-lamination due to poor material usage. Maybe I'm just lucky so far. Now, about turpentine. Most folks use OMG, Odorless mineral spirits. Turpentine smells bad (cheaper brands). Like below. 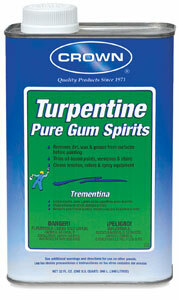 Turpentine is the traditional thinner for alkyds oils varnishes and enamels. It improves brushing qualities and cleans brushes rollers and spray equipment. You can spend the extra to get the highly refined brands. (They don't smell as bad) The Crown works for me. (I've also bought it at Walmart of all places!) I don't use turps except in mixtures and the small amount in my cup doesn't seem to be an issue. I do have a well ventilated studio. I also use it outdoors when cleaning a varnish brush. Just remember, OMG is for cleaning brushes only. Your mixtures must have turpentine if you are using damar varnish in them. Also, when you use a re-touch varnish, or do a final varnish on a painting, only turpentine will clean the varnish from your brush. OMG will not cut it. Your standard oil painting medium is 1/3 linseed oil, 1/3 damar varnish, 1/3 turpentine. I then add an alkyd dryer, and more recently a copel dryer instead to see if it a more workable time constraint. Since I paint in thin layers, I'm not too concerned about the copel. This isn't the case if you have lots of impasto passages in your work as the copel dries from the outside in, which again, can cause issues. I hope this will help in your decisions of whether to varnish or not. Just remember, use a better brush than he uses here, so you're not picking brush hairs out, and getting too many bubbles onto the canvas. What is amazing about this video, it shows how matt and sunken the painting was before varnishing. It really does boost you colors!